Would Churchill have supported Brexit? There has been a terrific amount of drivel written about Britain needing to engender some wartime spirit and defeat the enemy during Brexit. There has been some good commentary in the press for example this extensive research in E-International Relations by Alistair Steward. There is also, of course some complete horlicks floating around mainly in the Brexiteer press and the comments sections. This comment by Euan Scott: First sentence correct, second sentence complete make believe. Here another comment from the Telegraph newspaper on this article. Here Simon Coulter uses the same technique as the first comment - write some genuine text then make up some "analysis". Churchill may have shifted his opinion over the years, as many do, but after the war he became more in favour of a United States of Europe and all that that entails. So there we have it. I would like to add that I find it incredibly frustrating when I hear Brexiteers cry... "We don't want to be ruled by Germany!" Do they not understand that for every bit of "ruling" the Germans do of Britain... we are "ruling" them back in equal measure? 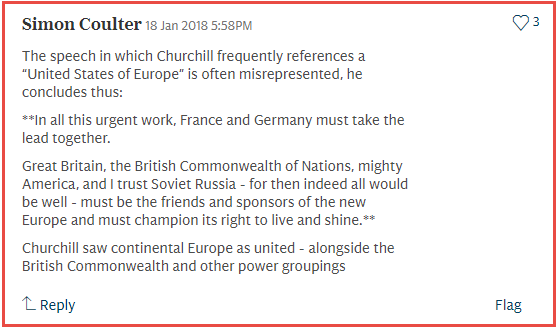 Did Churchill see Britain's role in Europe as a "great trading nation with our European friends?" or did he see some closer union? So I hope that settles it.